How Much Longer Before India's Flamingo Hub Will Cease to be a Flamingo Graveyard? Flamingoes have been known to fly into high-tension wires strung over saline wetlands, where the birds like to feed, but efforts to take the wires down have seldom succeeded. Brijesh Shah of Bhavnagar Animal Helpline has had a habit of visiting the salt pans of Kumbharvada, a known feeding site for flamingoes, on the city’s outskirts once a day. But over the last two months, Shah has had to visit them out of concern. He scouts the shallow waters, observing the flock, and hopes that he does not come upon a charred or decapitated bird around the 8-to-10-km-long stretch with high-tension wires overhead. The first incident they’ve been involved with was on 10 December 2016, when 20 of the pink birds were reported to have died after flying into the wires. On February 11 and then again over the next two days, more than two score birds had been electrocutes. The favoured feeding site had quickly devolved into a mass graveyard. “There is a wetland created out of unused salt pans and areas inundated with wastewater from Kumbharvada city,” Shah tells The Wire. “[Some] 1,500-2,000 flamingoes are seen here all year round as they come to feed in the shallow waters. But the high-voltage wire is right above that small valley. It is a 66-KV Gujarat Energy Transmission Corporation Limited powered line. As soon as the birds fly above the shallow lake after their meal, they collide with the wire just 50 metres away.” They’re killed instantly – either by electrocution or the force of impact. Shah and his colleague Shashikant, a veterinary doctor who answers the animal helpline, recall how, after the moment of collision, the birds turn black or just swell up and burst like balloons. The Gujarat Energy Transmission Corporation Limited (GETCO), however, denies that the birds in the last four incidents were electrocuted. They claim that the transmission line in question hasn’t been switched on in the last half year. When it was in use, according to GETCO, it was being used by Nirma, a company manufacturing household chemicals, at a facility nearby. The company is now said to be taking power from the Ahmedabad Highway Systems. In June 2011, hundreds of flamingoes were killed by the same high-tension wires in Bhavnagar – but GETCO remained stubborn, denying all allegations. It said that the birds could have been killed by something else. But after conservationists protested, the municipal corporation and GETCO asked Bhavnagar’s mayor to drain out the habitat and give the flamingoes no reason to visit the city at all. Thankfully, the forest department and environmentalists intervened, highlighting the importance of the wetland and the many years it had taken to establish a safe habitat. The habitat was spared. Gujarat is a flamingo hub in the country. Two species of flamingos are found here: the greater flamingo and the near-threatened lesser flamingo. Both species are residents of the state. Virag Vyas, who studied the lesser flamingo for his PhD – with special reference to ecology, threats and conservation management, says that the portion of the Gulf of Khambhat near Ahmedabad and Bhavnagar districts, the coastal areas of Bhavnagar and Jamnagar and Kutch are major congregation sites for the birds during their non-breeding season. In fact, ‘Flamingo City’ in Kutch has been promoted as a tourist destination for being the only breeding site for flamingoes in Asia, being home to over 1.5 lakh birds throughout the year. While the greater flamingoes do migrate over long distances, the lesser flamingoes are non-migratory nomadic species with flocks constantly moving between different feeding sites. Standing on their stick-like long legs in shallow mudflats, these birds stir up the bottom with their feet and duck their beaks down to catch their meal: shrimps, crustacea and algae. The carotenoid pigments in this food gives the flamingoes their distinctive pink colour. And the specialised habitat that provides this food is not available in many places in the world. These environments also tend to be naturally saline – and have been exploited by humans to produce salt over many centuries. So, even if the Kumbharvada wetland complex is small, it is still uniquely important for the flamingoes. It is a habitat they cannot afford to lose to rapid industrialisation, highway projects and the life-threatening high wires – a fact that bears repeating in the face of the number of times flamingoes have been threatened by human activities, and the number of times nothing changed. In 2010, the world’s attention was drawn by Gujarat’s Khadir region when no fewer than 400 flamingoes were charred to death after hitting the wires. About 400,000 flamingoes had migrated to Khadir that year. In 2011, Anika Tere, a zoologist at the Maharaja Sayajirao University, Vadodara, and B.M. Parasharya, an ornithologist at Anand Agricultural University, had published a study that stated: “A passing vehicle or even a flipping fish can create a flutter in the flamingo colonies, leading to the birds flying into the cables. Overhead wires are not visible to them and they do not have enough time to manoeuvre to avoid collision.” The duo mapped seven sites in Kutch, Bhavnagar and Jamnagar where high-tension cables ran close to flamingo sites. Under the media’s gaze, the forest department scurried to install radium tags on the wires in Khadir. These acted as reflectors and warned the birds stay away. Then again, it was over three years and repeated follow-ups by environmentalists before the wires were taken underground. In their study, Tere and Parasharya had briefly discussed the the Kumbharvada threat as well. “The collision of flamingoes with electric lines was noticed repeatedly at Nirma salt pans and Kumbharvada sewage pond in Bhavnagar district,” the paper read. 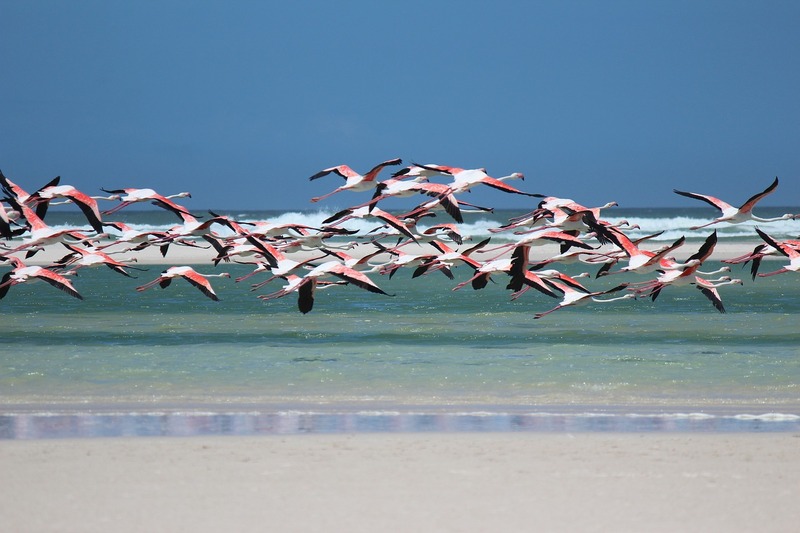 “The collisions at these sites are so frequent that the local fishermen have learnt to scan areas with overhead wires and collect the birds for consumption.” This warning was ignored – with the effect that flamingoes continue to be killed to this day. As it happens, the Central Electricity Authority has issued multiple guidelines to all states asking for appropriate measures to save wild animals from electrocution. They include putting spikes on the lines to ward off animals, taking cables underground where possible, inspecting transmission lines twice a year and investigating every electricity fault. Even the UN Environment Programme had released guidelines in November 2011. After the four incidents in Kumbharvada, the team from the Bhavnagar Animal Helpline installed a camera for a few days in the area. They wanted to prove – once and for all – to the media, the forest department and the government that the wires were killing the birds, contrary to what GETCO believed. Whether it was irony or sheer luck, no flamingo collided with the wires in this period. No new deaths have been reported since February either. Brijesh Shah says, “It is thanks to the security guards of the on-site Central Salt and Marine Chemicals Research Institute, who patrol the experimental salt farms. They call us so we can reach the site to see if any flamingoes can be saved.” Otherwise, the high-tension wires continue to hang over the feeding birds like a noose. Even if Khadir set a positive example in 2014 after taking over 9 km of cables underground, there continues to be a gap between what has been put down on paper and what is executed. One can only hope that it won’t take another flamingo massacre to jolt lawmakers out of their reverie. Atula Gupta is a science writer and editor. She runs a web publication focussing on endangered wildlife of India. She is also the author of Environment Science Essentials, a set of books for schoolchildren.